President Ivan Duque said Tuesday that indigenous protests in southwest Colombia are receiving the support of illegal armed groups after alleged guerrillas attacked riot police. 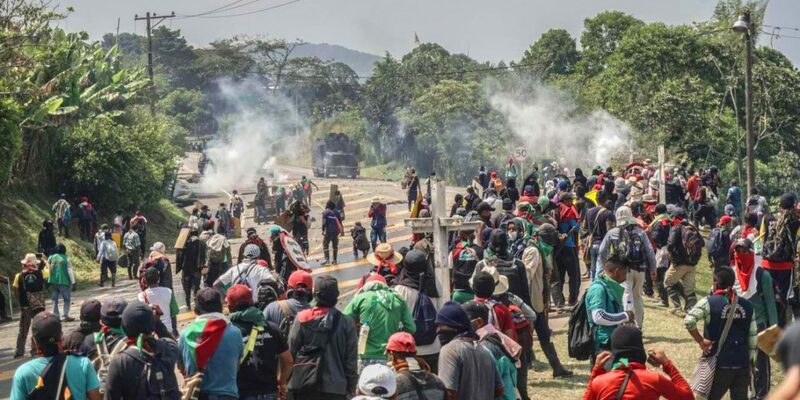 The indigenous groups in the Cauca province have been protesting for a more than week and closed the highway connecting central Colombia to Ecuador to force the president to talk about ongoing state neglect and violence perpetrated by illegal armed groups in their reservations. I profoundly reject what happened today with a member of the security forces. This shows that there are infiltrations by armed groups. Security forces told local media that dissident guerrillas of the demobilized FARC group ambushed police, killing one official and injuring six others. But the local community said that following the murder of the official, police opened fire on civilians, injuring six. We mourn the death of patrolman Boris Alexander Benitez under circumstances that are subject to investigation. We share the pain of the family of the deceased patrolman, just as we sympathize with the cry of despair that moves the country for the many victims and social leaders who have been killed as a result of the escalation of violence that Colombians have experienced in recent months, the product of a government policy that does not prioritize peace, and is in charge of stigmatizing legitimate expressions of protest, sowing hatred and blurring the already agreed peace agreements, giving way to the convulsed state that the country presents today, in the midst of the reactivation of paramilitarism and the dissident groups of the FARC. The alleged guerrilla attack on alleged violent police attack on protesters followed days of brutal repression of the protests that began 10 days ago. According to the protest organizers, multiple participants in the protests had already been injured in the protests. Indigenous leaders, who categorically reject any armed action in their territories, additionally claimed that they have received death threats since the beginning of the protests. The locals rose up early this month to demand talks with Duque over his administration’s chronic failure to implement peace policies in the troubled Cauca regions and seek solutions for ongoing land disputes between indigenous peoples and large landowners.